Today we’re joined by Hazel B West, author of On a Foreign Field, a historical YA novel which is book of the month in February on Goodreads group Books, Blogs, Authors and More. You can read our review of this great book here after you’ve read her interview! What were your main inspirations for On a Foreign Field? Well, since it is historical fiction, the original idea obviously came from the story of William Wallace. But this was not the first Wallace novel I have written, and I really wanted it to stand out from all the other iconic Wallace stories that are out there. So I took a plot line I love to read about: characters from different sides having to deal with each other, and quite possibly becoming friends eventually. I don’t think a Wallace story has been told from the point of view of an Englishman, the opposition, so I really wanted to give that plot line a try, thus I invented Reeve and told his story. Which of the characters is your favourite and why? Any author will tell you it’s hard to choose favorites, but I do have some characters I enjoyed writing more than others. I loved Reeve of course, but I think my favorite character from the book was actually Gavin, one of Wallace’s men. He was pretty fun, and I loved writing his continuous jibing of Reeve. How long did it take to write On a Foreign Field? Well, I had had the idea for quite a long time before I started it and had written a couple scenes down, but from the point of actually writing to finishing was probably about three months. That is not counting ‘post production’ and all the editing and formatting to get it ready for publication. Right now, I’m working on a very special pet project that I’m totally having a blast with! It’s a steampunk Victorian mystery novel featuring my new favorite character (don’t tell the others) Anthony Maxwell. It’s the first in a series I have planned and I’m hoping for it to be out sometime this spring. I’m very excited to see what people think about Anthony. Ooh, well, I would love to invite all my own characters, but besides them, historical people (if I can invite anyone I want, living or dead) William Wallace, of course, Rob Roy, Jack Chruchill, Constance Markievicz, Robert the Bruce, Manfred von Richthofen and Samuel Pepys. Yes, I love the song “Brothers in Arms” which is originally by Mark Knopfler but I really like the version by Celtic Thunder. Very moving song, and it was always in my mind when writing this. Victorian London. Yes, I’m a total Sherlockian, but also I just love that time period despite its imperfections. It was just such a fascinating time period and I’m so happy to finally be working with it in my Anthony Maxwell books. Oh yes, and sometimes that’s a very scary thing! I think all authors leave a little bit of something in their characters. It’s not quite so prominent in this book as some of my others; in my newest novel “By Blood or By Bond” my character Viggo is about as close as anyone could get to me. 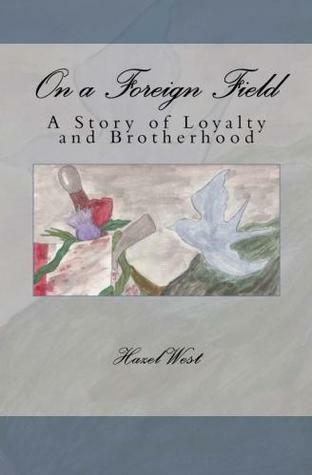 In “On a Foreign Field” I think I spread and shared my characteristics more between the characters. Ooh, I have several, I’m definitely looking forward to The Hobbit Part II this year, I absolutely loved the first one! And as for books, I’m very much looking forward to the sequel to “Raven Boys” and also the fourth Knight and Rogue book by Hilari Bell—I adore that series so much! And whatever John Flanagan is coming out with next, I’m looking forward to as well. I love reading a good mystery, with a nice cup of coffee or writing a mystery, which is the next best thing. But still with the coffee. Meeting fantastic people and actually having ‘real’ reviews written for my book by unbiased parties. Getting a five star review from someone you don’t even know is probably the most rewarding thing a writer can get, especially when you’re self published. But my favorite part is definitely the friendships I have made. First off, it’s always the same: righteous anger, because how dare they slam your baby? I get very very protective of my characters, so if anyone says anything bad about THEM, well, let’s just say I go i-viking. But there’s two kinds of bad reviews. Those that really are just to be mean and nasty, and those that are constructive criticism. And the latter, it might do you well to take a second look at because chances are, they are probably right. Sometimes they could have said it a little nicer, but you get the satisfaction of showing them they were wrong the next time! Sir Reeve Montgomery is an Englishman born and bred, proud of his heritage and the right to serve his country fighting against the Scottish rebels. But when the tide is turned unexpectedly during the Battle of Stirling Bridge, he is wounded by an English arrow, left for dead by his comrades, and taken captive by Wallace’s army. Wounded, and alone on a foreign field, he knows he should expect nothing but torture and death at the hands of the Scottish rebels who are known to be complete savages. But as he comes to know this tight brotherhood better, and sees Wallace’s utter devotion to his men and the cause of freedom, Reeve begins to wonder whether the English are right to oppress them. This entry was posted in Author Interviews, Interviews and tagged author, hazel b west, historical fiction, on a foreign field, william wallace. Bookmark the permalink.